How well is the current substrate weathering? Determine whether the current roof assembly is adhered sufficiently to the building’s substrate. Confirm that there are no areas where water has been trapped between the two surfaces, (you will experience a “sponge-like” feeling if this has occurred). Check all seams and joints around rooftop equipment. Are they still intact? Have they split, ripped or failed? Does your roof leak? If your roof has experienced any of the above symptoms, It does not necessarily mean that your roof is ineligible for a roof restoration system but it does mean that your roof has experienced some failure already and this condition needs to be dealt with quickly. We highly suggest contacting a roofing professional to evaluate the situation immediately so you have the option of saving time and money with a roof restoration system. Is there any damage caused by third parties? Unusual damage to the rooftop caused by foot traffic, birds, trades such as HVAC or something else can range from minor to severe. When inspecting your roof, make note of all signs of damage. Contact us and we will help determine the extent of damage and how to move forward. How old is the substrate? Typically asphalt roofs with a life of 15 years or less are ideal candidates, while single-ply and metal roofs often have a longer service life, but not necessarily and can be restored at an older age. It is important to note that if the roof has been properly maintained throughout its lifespan, the substrate (no matter what type) can have an even older service life and still be restorable. Is the roof too brittle or worn to coat? Climate zones can have a lot to do with this one. Areas with high humidity and rain, such as Hawaii, Florida, and the upper Northwest typically cause additional aging over regions that are dry. Ultra hot climates or climates that have severe swings in temperature, such as Arizona, Nevada, New Mexico, Texas, Oklahoma Colorado, also experience additional aging as the extensive heat and UV rays from the sun cause damage to the surface of the membrane, causing the roof to prematurely age. 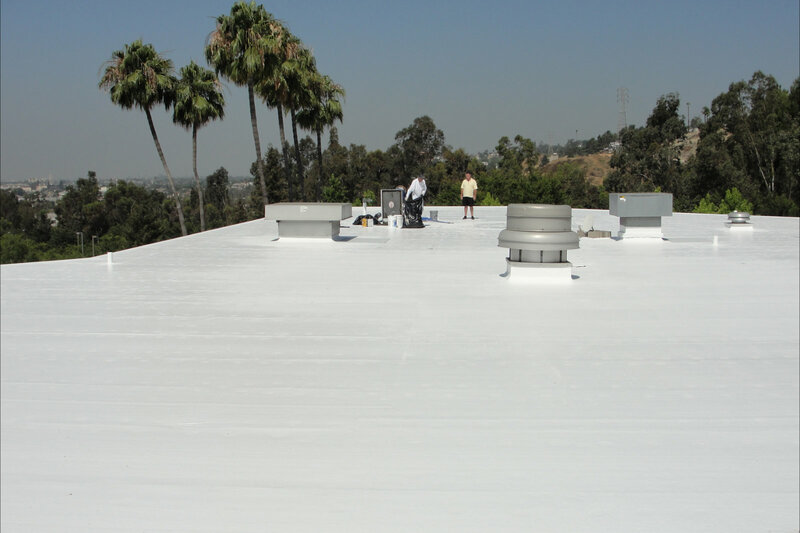 On the other hand, if your current roof was a Cool Roof, it probably provided your rooftop with additional UV protection, allowing your roof to age at a slower rate and resulting in less embrittlement. When the surface of the roof becomes too brittle, it can split and leak; therefore if you notice your rooftop deteriorating or chalking, contact us – don’t wait. We’ve restored multiple roofs with deterioration – check out our case histories for more information. While your roof may suffer from one or all four of the questions above, that does not necessarily eliminate roof restoration as an option for you. Most often, your roof can be restored, it is only every great once in awhile, that a roof has been too severely damaged and is unsalvageable. Roofing inspectors are trained and knowledgeable in determining if your roof meets the proper requirements for avoiding a traditional roof replacement and installing a roof restoration system. National Coatings can provide you with a roofing professional to examine your current roof and determine your options – Call us today 800-423-9557.